Now, we normally wouldn’t buy blackberries. Bramble bushes grow wild everywhere around here. In fact, when we first moved here, I was baffled by all the signs guaranteeing to permanently kill of blackberry bushes. It wasn’t until I realized they were taking over our back yard that I understood what an invasive weed they really were. Weed or not, you can usually see people stopped all over the place to harvest some tasty berries. Only…the wild berries this year…not so good. We didn’t have a very good summer and it really wasn’t worth the time to pick them. (Nor was it worth the flesh the thorns tore from our hands). The blackberries that we bought were so plump and juicy that we needed more. The farmer actually grew them on purpose and you could tell it was a labor of love for him. So Shaun and I piled in the jeep last weekend and headed back out to where we had seen that old blue pick-up truck. Our mouths started watering as we were so excited to find that he was there. The only problem was that his truck was full of corn…and nothing else. He took our phone number and told us that he’d call when he had some berries ready to be picked. The middle of last week, Shaun got that phone call and made arrangements to pick up a flat of blackberries and of raspberries today at one. I suggested to my sweet husband that he call to confirm that the berries were ready and could be picked as it had been raining for the last few days. Shaun phew-phewed me saying that they were honorable people that would call if there was a change in plans. We were finally on the right road and could almost taste those berries. Shaun approached the front door a little hesitantly (he was still a little nervous after his last encounter) as was relieved when the sweet little old lady opened the door. She assured him that he had the right place…but it had been too wet to pick the berries. She apologized and muttered something about thinking about calling but she always got the machine. Shaun crawled back in the Jeep, looking quite dejected. He out of all of us, was looking forward to those berries the most. Our of reverence for his great loss, I bit my tongue for as long as I possibly could. Yet somehow…the words escaped me. I had told him to call because of the rain, but no, he just wouldn’t listen to me. This entry was posted in Adventures, Family, It's all about me!, That Man O' Mine. Bookmark the permalink. Amusing adventure. Hopefully those berries will be ready for you soon. Those berries must have been very good indeed! We have a lot of wild ones along the trails up here and while they’re good they are tiny. Your’s sound delish! Well done. Mention once that it might be too wet to pick the berries but then let it go. If they did pick the berries maybe nobody will remember, and if it WAS too wet you get to throw the “I told you so” line at him. Now I’m craving berries! All I can find around here are in the store and the price makes my eyeballs pop out of their sockets. But, boy, do we have corn! Blackberries and raspberries are so expensive here in the city. $4.99 for 3 ounces! But I love them and pay it. No more berries for us. We’ve had a frost. Brambles really are a pest if you don’t keep them tamed. I have wild ones all over the place so we never have to plant any. Lynne~Find the Farmer…what a great name! Lisa~that’s how are wild ones are this year. Jay~Thanks, I thought so too! Kell & Frances~ I just can’t buy them at the store. They are never as good and they are soooo spendy. Peggy~We’ve got the wild bramble problem too…I’m still not sure why he cultivated them, but he did, and it worked for us…once. 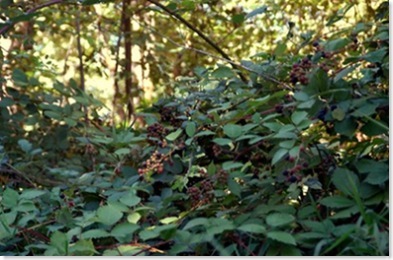 which is juicier…fresh picked blackberries, or saying i told you so?? I love blackberries, strawberries, raspberries – but not blueberries. Your life is always an adventure. The berries sounded so yummy. I hope you can get some pretty soon, oh yeh, call first though LOL. We women are really smart sometime. Most of the time. Many years ago, while visiting my sister who lived in Tacoma, we harvested raspberries from a neighbor’s bushes. What an abundant treat. We made everything raspberry we could think of. I guess the climate out your way is ideal for berries. I want some blackberries now too! 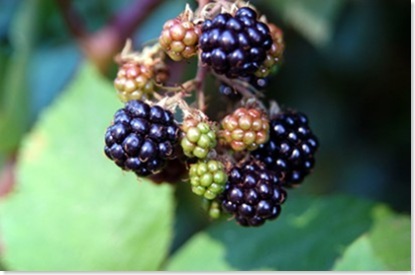 🙂 When we were in MI this summer, we had the best blackberries ever…I just kept popping them in my mouth as if they were candy….yummy!! 🙂 Nothing beats home grown veggies and fruits! I love how blackberries grow wild around here. And yes, many tiems we have to bite our tongue around our spouses. It’s so hard not to say I told you so! as a kid growing up outside auburn … I didn’t know that they were an introduced plant… not a native. We took fence pieces and laid them on the big evergreen bushes, crawled up on them and picked. it was heavenly. My saliva glands are quivering just thinking about it. How come you never let Shaun be right! I sure wish I was there to have some of those berries! Sure miss our berry picking with you and the girls. We don’t see as many wild black berries these days where I live in the UK. It was always a big thing to go black berrying. We grow some but they don’t taste the same as the wild ones ~or am I just being nostalgic!